Information on what is required to ride in Vermont can be found on the VAST web site. VAST TMAs can be purchased though our web site. You pay the TMA fee plus County and Club dues ($12, $3) and a fee to cover credit card processing and mailing per vehicle. We have some of the lowest dues in the state. Save some money and support a small club!!! 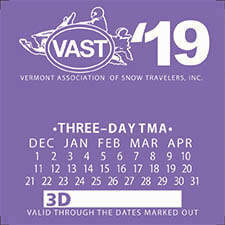 2019 VAST TMAs can be purchased online directly from the VAST web site. VAST adds $35/$20 dues and processing fee in addition to the TMA cost. Please be sure to select the Upper Valley Snow Packers from the club listing to support our club. Pay close attention to which registration type and form you are using. There is a separate link for family pricing after the required number of full priced registrations are complete. Alternatively, download the 2019 TMA application, complete the form(s) and return with payment via mail to the address below. Requires (1) form per sled. Form must be signed by the applicant.